LAKE FOREST, Calif., May 24, 2017 /PRNewswire/ -- Schneider Electric, the global specialist in energy management and automation, today announced Almarai, the world's largest vertically integrated dairy company, expanded its Schneider Electric deployment as part of a Smart Manufacturing initiative by deploying Line Performance Suite. As an existing Wonderware user, Almarai will add Line Performance Suite, workflow, MES Operations and Quality Management to its Schneider Electric Manufacturing Execution System (MES) spanning over 100 filling and packaging lines. Anticipated benefits include streamlined data gathering, increased agility and improved operational efficiency. 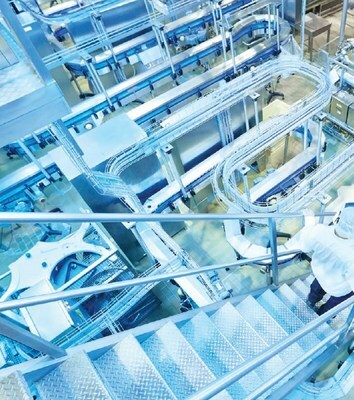 Food and Beverage manufacturers are embracing new strategies to digitize operations, simplify production processes and be "smarter" about manufacturing process execution. This transformation is global, driving significant investment in Industrie 4.0 initiatives to better capture and analyze operational data. Increasing access to information and applying predictive analytics strategies can yield actionable intelligence that improves performance. "Our Schneider Electric solution has provided a platform to best manage production requirements and initiate process improvement. The model-driven approach included in Line Performance Suite helps to accelerate deployment by standardizing operational processes with reusable templates and integrated workflow. Our next step is to gain better visibility to this data to empower our team to make smarter, more informed decisions," said Sjur Fitje, GM Manufacturing at Almarai. "We are thrilled to work with Almarai and they are truly an industry visionary. By leveraging our Line Performance Suite as part of their manufacturing operations management solution, Almarai can create an intelligence hub for the company that offers a 360 degree view of operations. Almarai's addition of new capabilities can be readily added to our platform-based solutions to achieve greater efficiency, planning, and profitability," said Nayef Bouchaaya, Director, Software Business Middle East at Schneider Electric. "We expect the added visibility and intelligence, including the ability to run reports consolidating near and long-term data, will positively impact how we perform process improvements and ultimately drive even greater customer satisfaction," continued Sjur Fitje at Almarai. Learn more about Schneider Electric's Food and Beverage and other software-based manufacturing solutions. Schneider Electric is the global specialist in energy management and automation. With revenues of ~€25 billion in FY2016, our 160,000+ employees serve customers in over 100 countries, helping them to manage their energy and process in ways that are safe, reliable, efficient and sustainable. From the simplest of switches to complex operational systems, our technology, software and services improve the way our customers manage and automate their operations. Our connected technologies reshape industries, transform cities and enrich lives. At Schneider Electric, we call this Life Is On.